Yes, this blog is about photography, but sometimes we come across image-making that we just can't pass up. It is shot on a Nikon D3 (and one shot on a D80), as a series of stills. I used my Tamron 17-50mm f/2.8 and Sigma 50-150mm f/2.8 lenses for all of these shots. Most were shot at 4fps in DX crop mode, which is the fastest the D3 could continuously write out to the memory card. The boats had slower frame rates, and the night shots used exposures up to two seconds each. The camera actually has an automatic cut off after 130 shots, so for longer shots I counted each click and quickly released and re-pressed the shutter release after 130 to keep shooting. After he amassed his 35,000 stills over the course of five hot days and two evenings in August of 2009, he began putting the look together in post. The footage was shot as raw NEFs, which I organised and colour graded in Adobe Lightroom. I always shoot raw, as it gives you so much more latitude when grading. These were then output as 720p jpg sequences and quickly stabilised to do the initial edit. Once the edit was mostly locked, all the final footage was re-output at full 2800px resolution, tracked, stabilised and the DOF effect and movement added in Eyeon Fusion, using Frischluft Lenscare. I output the final shots at 1080p. Although most shots stay with the basic tilt-shift effect, some have focus pulls, or more complex depth mattes were built up along with some paint work to allow buildings to drop out of focus next to the in-focus ground. This would not have been possible if I had shot using tilt shift lenses on the camera, which works best with relatively flat landscapes. New York City is anything but flat! I did some initial tests a while back using a rented 24mm tilt-shift lens, which is the standard way to do this. However, after my tests, I found it made much more sense to do this effect in post, rather than in camera. Shooting tilt-shift requires a tripod, as it is very hard to stabilise afterwards, and gives less flexibility in the final look. I opted to shoot it on normal lenses, which allowed me options in the depth of field and shot movement in post. I used a tripod for the night shots, and my Gorillapod (which is much more portable) where possible, but many locations—like hanging over the edge of a roof or through a gap in fencing on a bridge-- had to be shot hand held, and the inevitable wobble removed afterwards. 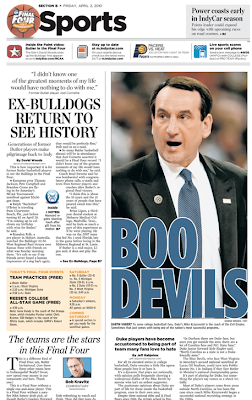 Yes, it's hard to root for the Duke University basketball team if you didn't go to school there. The school is expensive, the kids are really smart, and someday they'll likely be your boss. But maybe more than anything, Duke wins a lot. It's a little like rooting for the Yankees, or U.S. Steel. 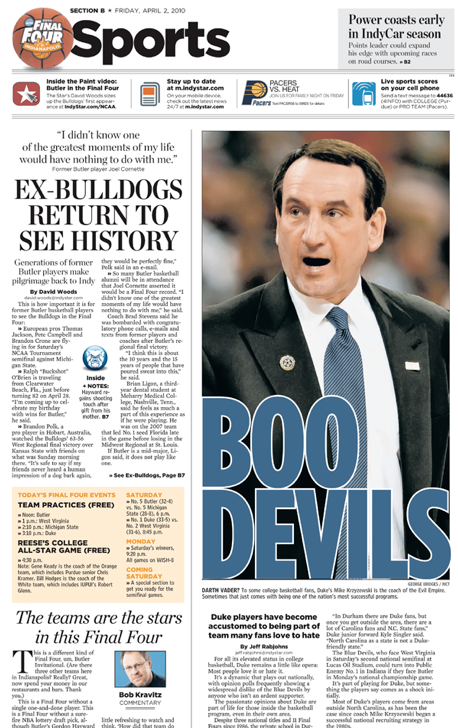 On Monday night Duke won its fourth national championship under coach Mike Krzyzewski, and in the process ruined the storybook season of the Butler Bulldogs, the little school (4,200-enrollment) that made it all the way to the NCAA championship game. Coach K called the first illustration "juvenile," and he's right. But then, what's he going to say? And I know I'm a bad person and all, but I really like the first illustration a lot better. It was fresh and original, not tired and familiar like the second one. And which illustration might make you more likely to read the story? It seems harmless enough to me, and it had the kind of creative verve that newspapers could use right now. And I'd bet the Duke students themselves might have thought it was funny. They are famously clever fans, and on Monday night, as the sportscasters set up the game, there was one student in the background crowd holding up a hand-made poster that said, "Distracting Poster." So here's to you, nameless art department person who created the original illustration. Go Bulldogs. 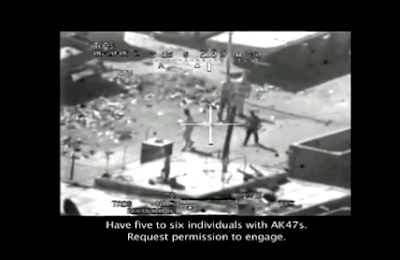 WikiLeaks acquired and today released classified military video footage that shows two Reuters photographers killed by fire from an Apache helicopter as the journalists carried their cameras in a Baghdad neighborhood. About a dozen people were killed in the incident, and two children were also seriously wounded. "After demands by Reuters, the incident was investigated and the U.S. military concluded that the actions of the soldiers were in accordance with the law of armed conflict and its own "Rules of Engagement". "WikiLeaks wants to ensure that all the leaked information it receives gets the attention it deserves. In this particular case, some of the people killed were journalists that were simply doing their jobs: putting their lives at risk in order to report on war. Iraq is a very dangerous place for journalists: from 2003- 2009, 139 journalists were killed while doing their work." More discussion of the video is here, and at the NYTimes, among many other places.